Summary: In a village by the sea, a woman and her child wait for their fisherman husband/father to return. Near the baby’s cradle is a hole in the wall. Inside that hole is a cricket who is painting a picture of a fisherman on the sea. The fisherman in the painting is dreaming about his family at home, waiting for his return. 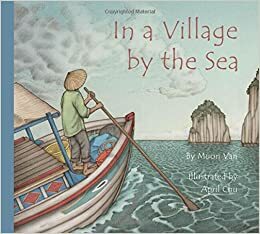 An author’s note tells about her father, a Vietnamese refugee, who made his living as a fisherman, and her mother, who raised their nine children while he was away. Ages 4-8. Pros: A deceptively simple tale that moves inward from the sea to the tiny cricket in the hole then back out again. The illustrations are gorgeous and evoke a feeling of home, while showing details of the Vietnamese culture. Each picture presents a unique perspective. The author’s note adds an interesting dimension to the text and illustrations. Cons: I didn’t find the cover as appealing as the illustrations, so it took me awhile to get around to reading this book. Sounds like you judged the book by its cover…..